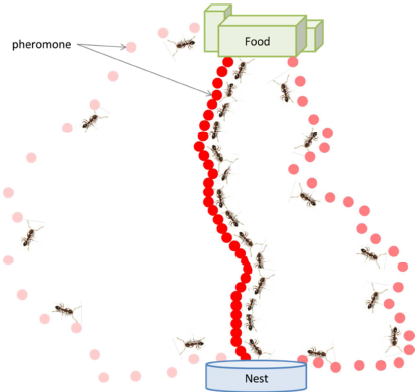 Propagation and Back-Propagation Diffusion through Neighborhoods Algorithm or PB-DNA is an optimization heuristic that belongs to Ant Colony Optimization Algorithms (ACA). The approach is inspired by behavior of some species of ants (Solenopsis Invicta) in distress situation. In an exploration space that may be a non-structured organization without centralized control entities, autonomous and elementary threads (called ant-agents) use the direct communication diffusion process by propagation and back-propagation explorations in order to extract the global minimum from a set of local minima. La donnée devient une puissance et une arme redoutable aujourd'hui. Les masses de données crée la connaissance et aide à la prédiction de l'avenir. Notion du paradigme des systèmes multi agents. Son application et ses concepts clés à la NASA.